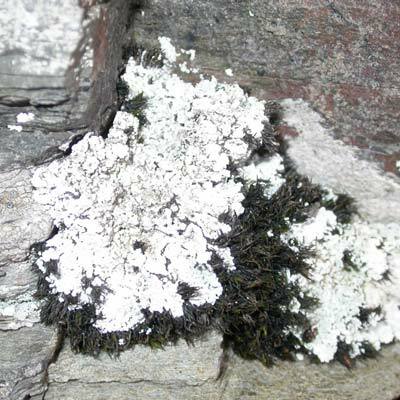 This lichen of dry, sheltered rock outcrops should be searched for along narrow stream courses, in underhangs and on bracken-covered, boulder-strewn slopes. It favours siliceous rocks and is easily recognised owing to its neat, yellow-white, powdery or fluffy (leprose) thallus, rosette-like growth form and strongly lobed margin. Individuals can be anything from a few centimetres to 20cm across. Although shaded, near vertical rocks appear to be its primary habitat. It can also occur on tree boles and on mossy surfaces. Frequent in western Ireland; scattered elsewhere. Lookalike species are mostly found in limestone habitats which this is not. Simms, M. J., (2016). Leproloma membranaceum (Dicks.) Vain.. [In] LichenIreland.